Maura Daly is a midwife with 15 years of experience working with disadvantaged and marginalized populations both in the U.S. and abroad. She chose to be a midwife when she was still an undergraduate at Hampshire College because she felt drawn to the age-old profession as a very simple, yet essential way to help women. She began her training on the U.S.-Mexico border providing care to women from both sides of the border. 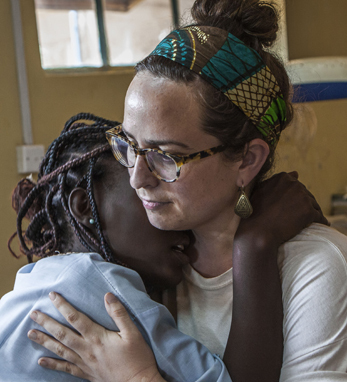 She now works for Doctors Without Borders providing medical humanitarian aid and has worked in such various places as South Sudan, Yemen, Nepal, and Sierra Leone. As a midwife, she has found that she speaks a universal language that allows her to care for women, babies, and families everywhere no matter religion, politics, or culture. She decided to work with Doctors Without Borders because she feels a duty as a midwife to care for women who live in some of the most dangerous places in the world to be pregnant. She has attended thousands of births, but still gets a rush of joy to see those first sweet moments of life. Both of her parents are Irish, coming from Co. Cavan and Co. Clare. They met at an Irish dance in the Bronx in 1960. She grew up in a house filled with Irish music, and though her parents had little education themselves, she was instilled with a strong belief that education and hard work were essential to succeed, but that compassion for fellow human beings was equally as important.